The re-order quantity is set in the 'Inventory Purchase' screen. Warehouse inventory items whose quantity in stock falls below the reorder quantity are displayed in the 'Parts to Re-Order' screen. Viewing of parts can be indexed by either stock number or manufacturing part number. When the quantity of a part in the inventory falls below the reorder quantity it will be displayed in this screen. And when the quantity rises above the reorder quantity by either receiving more or by updating inventory, the part is removed from this list. 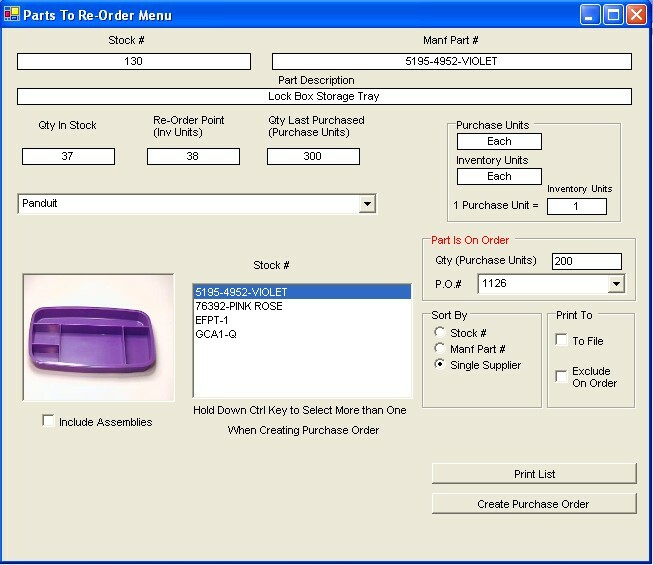 The user may select the items that fell below the reorder quantity and create a purchase order directly from this software screen.